Andy has published a Song Book. The Hardback edition is highly recommended! (1988). 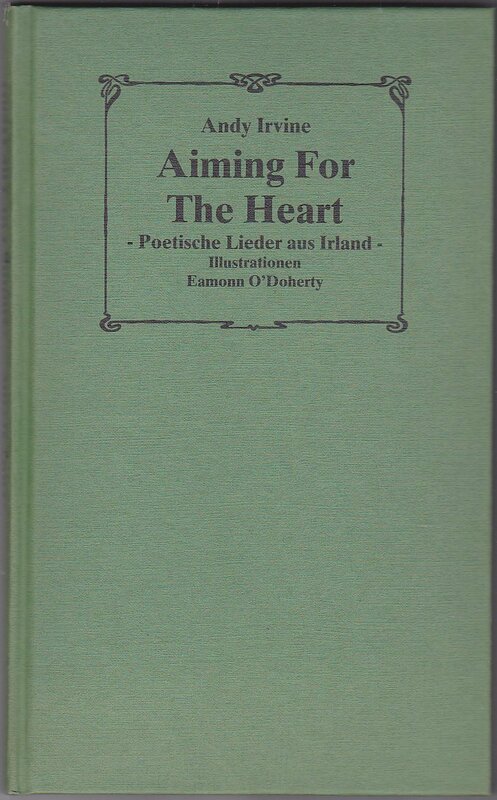 Aiming for the Heart (1st ed.). Germany: Heupferd Musik Verlag GmbH. ISBN 39-2344-501-6. (2008) Aiming for the Heart: Irish Song Affairs (2nd expanded ed.). Germany: Heupferd Musik Verlag GmbH. ISBN 978-3-923445-05-9. Available now! The songbook of Andy Irvine. His early masterpieces. Lyrics, notes, chords, comments, discographical datas and illustrations by Eamonn O’Doherty. Intro Paul Brady. Among this rapidly developing morass of mediocrity, Andy Irvine’s voice stood out like a welcoming light, a warm fire on a winter’s night. This warmth and integrity has remained with him ever since. But Andy’s singing is only half of the story. His harmonica playing and ready facility with almost any stringed instrument led him from his earlier days with “Sweeney’s Men” to become one of the cornerstones of the legendary “Planxty” sound – a sound which, throughout the seventies, gradually and permanently changed the way the world looked at Irish music. Nevertheless, all this talent would have amounted to little were it not for Andy’s “ear for a good song”. Few singers over the past years can claim to have brought to the attention of listeners such a wealth of classic and beautiful songs – and not only those traditional tunes he painstakingly researched and lovingly arranged but also his own compositions. The best of his early songs are now collected together in this book and not before time. If you the reader, can derive one tenth of the pleasure from it that I have – well then your money will have been well spent. Good singing and happy reading!